The salt flats in Badwater Basin in the Death Valley National Park in California, USA cover nearly 200 square miles, among the largest protected salt flats in the world. 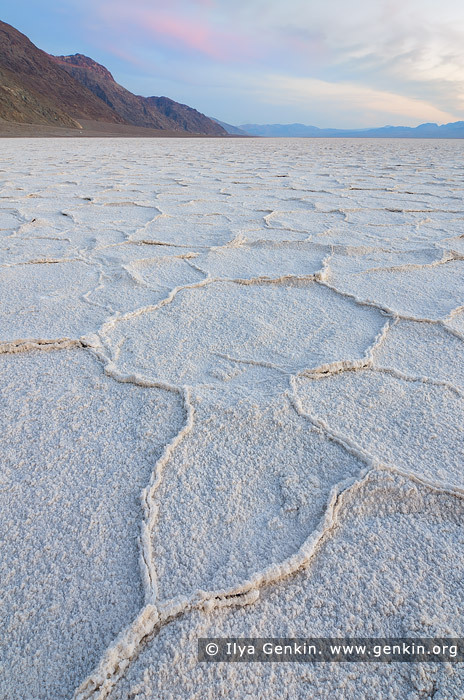 The vast, surreal salt flats of Badwater Basin change constantly. Salt crystals expand, pushing the crust of salt into rough, chaotic forms. Newly formed crystals ooze between mudcracks, sketching strange patterns on the surface of the salt flat. Passing rainstorms wash off windblown dust and generate a fresh layer of blinding white salt. Floods create temporary lakes that dissolve salts back into solution, starting the process all over again. This image belongs to the travel and nature stock photo library. This stock photo of Badwater at Twilight is available for licensing for commercial and editorial uses including websites, blogs, books, magazines, brochures and advertising. Restrictions may apply for images which contain third party copyrighted material or sensitive subjects. Photos of artwork are for editorial use only. This image id US-DEATH-VALLEY-0009 of Badwater at Twilight, is copyrighted © by Ilya Genkin. This is not a public domain image.